This entry was posted on Friday, January 15th, 2016 by Frances Ryan. 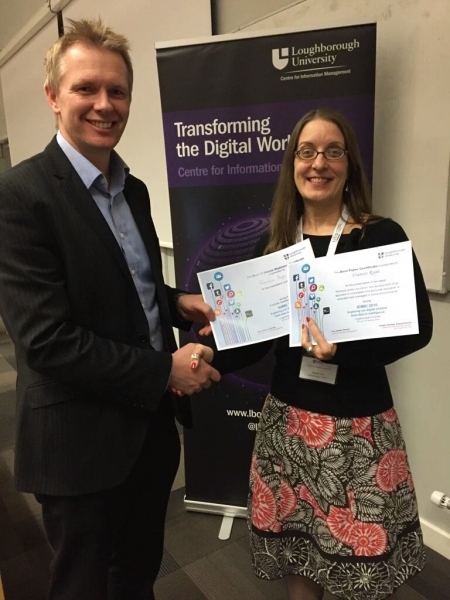 I attended the International Data and Information Management Conference in Loughborough (England) this week. The conference was a great opportunity to meet with other information science researchers—and to present my own research. But it was also a great opportunity to win back some of my academic self-esteem and self-confidence. And winning all of those things is fantastic! Winning (and just participating in) the quiz helped me to network with other delegates. Winning the 5-minute madness presentation helped me to realise I’m a better speaker than I thought. And winning the best paper is, well, that’s just awesome—especially for my CV. But better than all is that those winnings helped me to win back some of the self-esteem I’ve lost over the course of my life. Winning those things helped me to win back some of my academic confidence. Those winnings helped me to remember that I am actually a pretty smart cookie with a lot of ability. I just have to have more faith in myself. And even better still is that winning back some of my self-esteem and confidence means that I am feeling a bit more positive about my ability to succeed. Yes, I feel a little bit closer to being a butterfly now. And importantly, I feel motivated to continue on the path to success!